Art teacher at Epsom Grammar School, Auckland, New Zealand. KNOWING: Look at the work of professional artists who work with clay. Show pictures, photos, samples of clay work (preferably an example of a clay tile) Discuss the work you share- style, clay used, glazing, burnishing, painting, decorations etc. Get used to the art vocabulary associated with clay. KNOWING: By exploring clay, the children will learn what clay can/not do. This begins with the children touching, rolling, forming the clay. Doing this will help them develop ideas and skills for when they begin their tiles. MAKING: If the children have no experience working with clay, time must be allowed for them to experiment and to see what properties it has. If you give the children each a small lump of clay, ask them to find out about it. Suggest poking, pulling, rolling, making marks on it and in it, pinching, attaching more clay and texturing it. Sit in a circle and let the children to follow some simple instructions- make it into a round ball/ make a finger hole in it/ make a pattern over it with your fingernail/ pull a piece off/ roll it into a ball and attach it again etc. Get the children to make something more specific- a dog/cat/snail. Encourage the children to see the clay as a 3D form that needs to be looked at all over. EVALUATION: Children experimented with the clay to become more aware of its properties and processes in making a clay tile. KNOWING: By using the skills and techniques, from the previous lesson, the children will attempt to create a clay tile, using their hands and various tools. Learning how to create shapes and attach them. MAKING: You will need to pre-cut a clay tile for each child (as this is very time consuming it should be done before the class begins) Demonstrate rolling the clay, using a rolling pin, bottle or thick plastic tube. Make each tile about 1- 1 ½ cm thick (about ½ inch). Don't make the tiles too small, especially when working with young children- mine were about 15cm wide and 20cm long. Talk about the theme they will be using ( we had studied insects- ladybirds and butterflies- for 3 weeks and the children were very familiar with them- otherwise lots of pictures to use as a reference would be helpful. Discuss how the children can add clay to their tile to create their insect. At this point you will need to discuss the scratch and slip technique, to keep pieces of clay from falling off. Encourage the use of different tools, but remember that their fingers are often the best tool. EVALUATION: Children could connect/ attach clay using the scratch and slip process. Children were able to make a sound basic form by modeling. KNOWING: How to use and apply paint to fired clay. How to mix colours effectively. MAKING: Children paint their tile. EVALUATION: Children produced a finished work of art. Children discussed their work with others and looked at others work. While in-between working on their tiles the children will need to keep them covered in an air tight plastic bag- the clay will stay moist for a long time as long as no air gets in. When fired paint and varnish. There are lots more specific skills needed by you and the children so get lots of books out before you start and read up on clay. Remember that clay is a difficult material and you may have some disasters- but don't worry they can look good to. I worked with 24 children alone, but I recommend you get parent help and put them with each group of about 4-5 children. This is an exciting unit and took about 8 WEEKS to accomplish at one lesson a week for about 1 ¼ hrs. SOURCE: (What will you start from?) To work with materials, tools and processes that are used when working with clay. ACTIVITY:(What you will do?) To create a clay tile using an insect theme. IDEAS: To use insects as a theme for making a clay tile, focusing on butterflies/ladybirds which we had been studying. KNOWING: To look at different cultures and explore how clay has been used in pottery. To look at a NZ potter and explore how they use clay in their work. ATTITUDE: To learn how to use clay and create a tile, thinking of the processes and skills involved. MAKING: To develop an understanding of the properties and character of clay. To develop a knowledge of the tools and equipment used in making clay tiles. *The children worked with Abbots White clay. Lakeside Pottery's page- An article on creating, cutting and drying clay tiles. 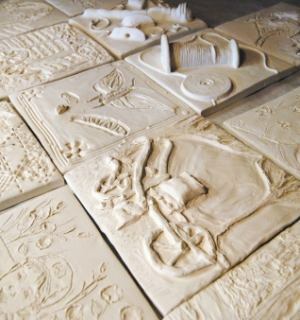 Stone Hollow Tile- Students can see what some artists have done with clay tiles. There are a variety of tools you could use with your students on this lesson. For younger students you could use Pottery Tool Set that are made of plastic. For older children you can buy Clay Modeling Tools from a variety of vendors.